Your bedroom is one of the most important rooms in your home. It’s where your days begin, your night ends, and where you relax on the weekends. To make this all-important space as relaxing, cozy and comfortable as possible, you have to have the essentials. These include things like warm, fluffy bedding, cozy seating for curling up with a good book, and (of course) places to put all of your stuff. But then there are the intangibles – those things you might not think of immediately when questions of comfort arise. In fact, you might not think about them at all, but they have a big impact on how comfortable your bedroom really is. First on this list is color. Color sets the overall mood in any room. In a bedroom, where we most need to strike a calm and relaxing chord, the color becomes an even more important part of creating a sanctuary. Picking a color that you love, and pairing it with the right secondary colors, is the best way to create a space that you will enjoy – one in which you can relax and refresh. To help you put together your own at-home oasis, we’ve gathered seven color palettes that are calm, serene, and relaxing. Incorporating any of these lovely palettes into your bedroom is a sure way to create a room that you can count on to be the perfect antidote to a long day. This fresh, crisp space featured on the Dreams and Jeans Interior Envy blog is the ideal place to wake up every morning. The dark wood floors paired with an abundance of clean whites are bold, yet soothing. The touch of blue on the duvet is a pretty way to add a pop of color that still works well with the surrounding environment. What could possibly be more relaxing than a color palette inspired by the beach? This lovely seafoam-colored bedspread is subtle but still pops against the cool gray walls in this bedroom, featured on Lark and Linen. And the golden-colored pillows are still neutral, but really add a punch of excitement to the space. Doesn’t this room from The Design Chaser just scream relaxation? This soft, clean palette is the perfect combination of tranquility and luxury. Using fresh, white linens and a neutral palette similar to this gives your bedroom a hotel-type feel, making it easy to fall into the covers and imagine yourself somewhere far, far away. There is just something about cool grays and blues that gives any room a smooth, laid-back vibe. In this bedroom featured on the SF Girl site, the paint color has a touch of purple, giving it a regal, sophisticated feel. Meanwhile, the lighter grays and whites in the space make a statement against the darker painted wall. Investing in good white bedding like this is one of the best ways to make your space feel relaxing and comfortable. Soft pinks are another favorite to use when it comes to creating a relaxing mood in the bedroom. Paired with a few simple neutrals, this pretty color is the perfect way to add a soft touch of soothing femininity to a bedroom, like this one featured on the SF Girl site. This is another bedroom with a relaxing and soothing palette (from Habitually Chic). And even though this one is a little bit moody, it works just as well. The rich, navy walls paired with bright and light bedding look sharp, yet comfortable. The dark walls create a cozy environment that would make getting out of bed an unthinkable chore. This palette of warm creams and whites, featured on Lark and Linen, looks relaxing and effortless. 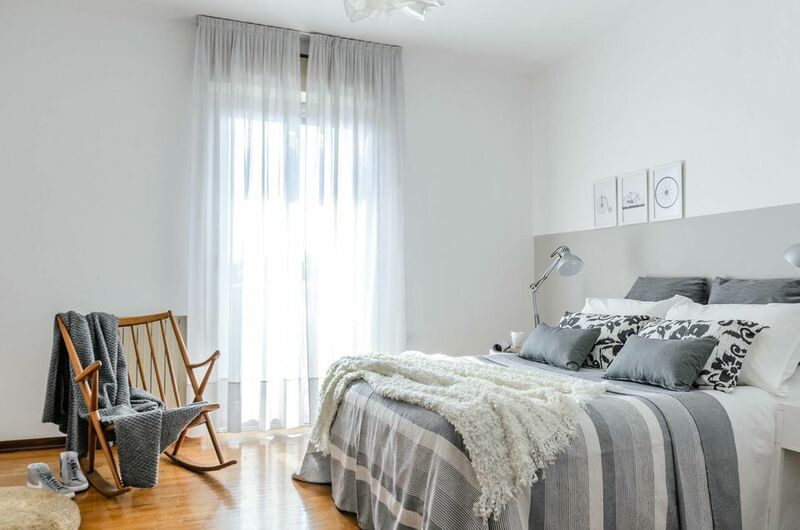 An inviting pile of cozy throw pillows and faux fur throw blankets adds up to a bed you can't wait to jump into and a space that you'll hate to leave. To create some contrast, try throwing in a few dark browns and woods to warm up this cool palette.